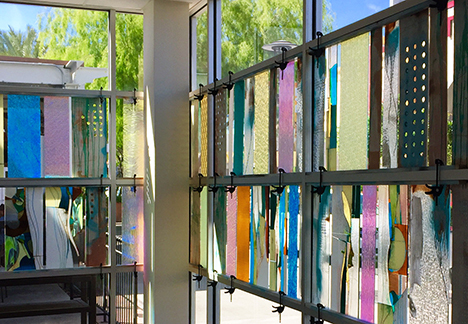 For close to two decades Troy Moody has devoted his creative energies to acquiring and refining an intimate understanding of design and line composition as it relates to stained, leaded and kiln-formed art glass. The focus of his career thus far, has been primarily site specific and architectural in nature. The intent for the IN FLUX “A Veiled Aesthetic” is to engage the public with a contemporary comment on architectural ornamentation and the transient nature of reality. 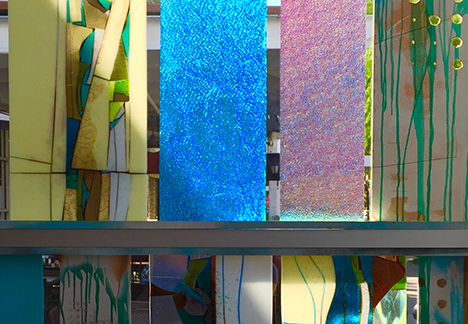 Moody uses the dynamic personalities of glass to examine individual concepts of the ordinary versus the spectacular in our daily lives, and to comment on the mundane and the extraordinary as experienced in our communities, neighborhoods and mental landscapes. This installation was commissioned by The City of Glendale.